? 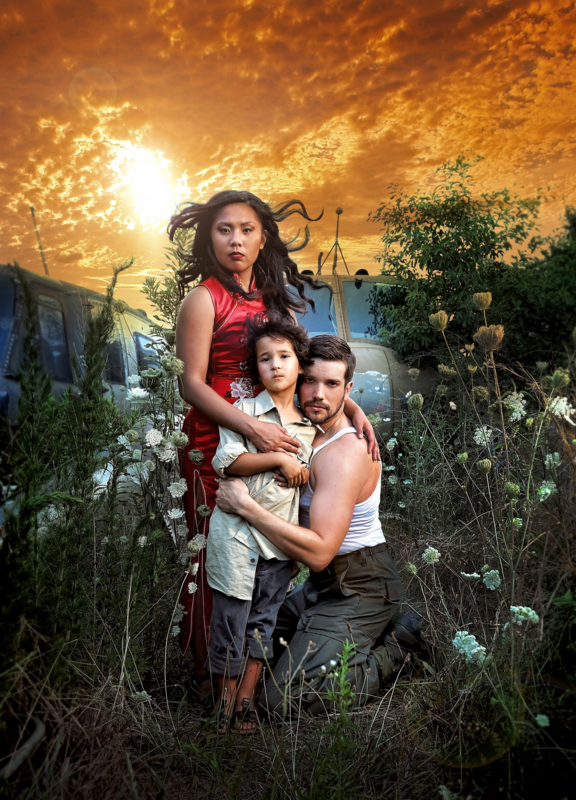 One of Atlanta’s hottest theater tickets this summer is Miss Saigon at Serenbe Playhouse. The musical has pre-sold five times more than the venue’s previous biggest hit, last summer’s Evita. The run has also been extended for a week — all this before opening night! Artistic Director Brian Clowdus and co. are bringing all of the drama you’d expect from a Serenbe production, including landing a real Huey helicopter at the show’s conclusion every night. It’s a spectacular way to usher out the show’s final regional production before a Broadway revival, slated to arrive in 2017. ?? ?? Clowdus channels highly cinematic elements for this production, including costuming actors as Vietnamese locals and U.S. soldiers serving drinks and greeting the audience. Miss Saigon comes from writers Claude-Michel Schonberg and Alain Boubill, who both also co-wrote Les Miserables. The musical is based loosely on the story of Puccini’s opera “Madame Butterfly,” but set in 1970s Saigon. ?? ?? “It deals with one of our most heated topics, the Vietnam War, but that really serves as the background to a love story,” Clowdus says. “For me, I’m never interested in telling a story about a war, it’s a story about people and how they are affected by the war.” ?? ?? ?? Given that half of the characters in the show are Vietnamese, casting can bring up some tricky questions about “racial accuracy,” and the original Broadway production faced protests regarding the use of makeup to change skin tones and facial features of some of the actors. Serenbe conducted a national talent search, obtaining hundreds of video submissions in order to complete the cast. “It was very important to me to cast Miss Saigon in a way that was racially accurate,” Clowdus says. “We decided to cast every Vietnamese role with an Asian-American. I have a commitment to local talent first, but if they’re not here, I’m not going to cast someone who is not appropriate for the role.” ?? ?? In addition to bringing in five actors from outside Atlanta, including Niki Badua in the lead role of Kim, the audition process expanded the casting pool for future Serenbe productions. While “colorblind casting” is often used to great effect in cities like Atlanta where there is a diverse talent pool, Clowdus says, “The purpose of colorblind casting is to give people of color opportunities, it’s not to give white people opportunities in roles of color. There are certain shows that you can colorblind cast, but Miss Saigon is not one of them because, while it’s a love story. It’s about two different worlds, America and Vietnam, period.” ?? With the addition of new talent to the Serenbe casting pool for this and future productions, Miss Saigon should be the next step in the exciting journey of this relatively new theater company. Now Clowdus’ biggest problem is figuring out how to top this production with the soon-to-be announced new season.